Health care appointments can be stressful for any patient. Research shows that patients forget 50% of the information shared during an appointment. Contributing factors include stress; too much information provided too quickly, unfamiliar medical jargon and the patient’s self-confidence level. 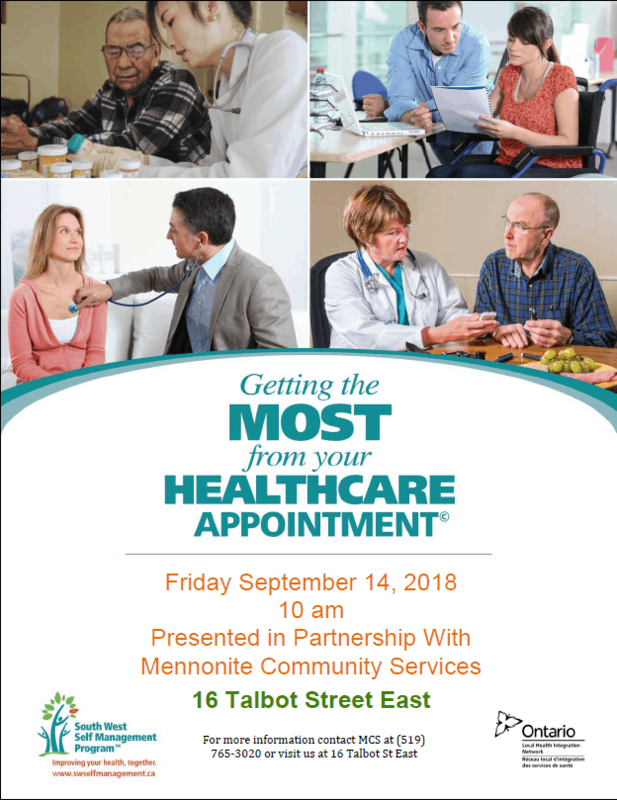 MCS, in partnership with the SW Self Management Program, is excited to present the “Getting the most out of your healthcare appointment” workshop. This 1 – 1.5 hour, interactive workshop, focuses on what to do before, during and after an appointment and uses action planning to optimize people’s health. This workshop prepares and empowers individuals to communicate more effectively with their health care provider. If you are interested in attending the workshop, please call MCS at (519) 765-3020. Please pass the news about this workshop along to anyone whom you think would benefit from it!